It has only been in recent years that government leaders appear to have successfully separated their nations from the grip of the Rothschild banking syndicate. While Iceland's bold moves to fight a financial crisis by arresting a number of alleged "crooked" bankers and excusing personal debts made big headlines in about 2006, few noticed that Russia's Vladimir Putin was doing something very similar. Then in 2010 the new Fidesz-party government of Prime Minister Viktor Orban in Hungary made a dramatic move to convert foreign-currency mortgages and nationalize $13 billion in private pension-fund assets to help his nation climb out of the same kind of debt that was gripping much of the world. When Jose Barroso, chairman of Goldman Sachs International and President of the European Commission wrote to Orban, warning that his actions "seriously harm" Hungary's interests in obtaining a financial aid package, Orban told him that Hungary "will stand on our own feet." Orban was right. In spite of legal proceedings launched by the European Commission in 2012, Hungary's economy began showing signs of recovery right away. When Putin took the reins as Russia's president in 2000 his country was bankrupt. The nation owned $16.6 billion to the Rothschild-controlled International Monetary Fund and another $36 billion to the Paris & London Club of Creditors, which is also a Rothschild enterprise. Putin seized control of a portion of the profits of Gazprom, Russia's largest oil producer, and used the money to pay off that debt. His timing was perfect because the world was experiencing a big boom in oil prices at the time. The debt was completely paid by 2006 and Putin established a new policy that declared financial independence from the Rothschild-controlled banking system. As one writer for the rebel website Political Vel Craft explained it: Putin's actions "make the New World Order Bankers very nervous." That phrase, "New World Order" was a code describing the City of London, one of the Jesuit city states that currently controls much of the world. The Iceland story made headlines around the world. When the big Kaupthing Bank went into default in 2008, instead of bailing out the banks as was done in the United States, the government conducted an investigation, arrested and charged the banksters responsible, and forgave debt burdens affecting more than a quarter of the people. Iceland's economy has been booming ever since. 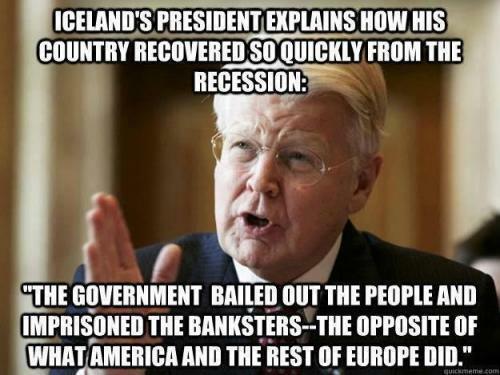 Once it was determined that the Iceland banks were "beyond saving" the government "stepped in, ring-fenced the domestic accounts and left international creditors in the lurch," one report stated. Of course we all know who those international creditors were. Knowing the history of past U.S. presidents who attempted to free the U.S. from the heavy debt from money borrowed from the Rothschild banking system, we wonder about the safety of Island President Ólafur Ragnar Grímsson, Russian President Vladimir Putin and Hungary's Prime Minister Viktor Orban. The last U.S. president that tried to shut down the Federal Reserve, which feeds from the Rothschild trough, was John F. Kennedy. The president before Kennedy that tried to escape the International banking system by issuing greenbacks was Abraham Lincoln. Other American presidents who attempted to pull the nation away from the Jesuit controlled banking system and ended up dead were Zachary Taylor in 1850, James Buchanan in 1857, James Garfield in 1880 and William McKinley in 1896. Russian Tsar Alexander II, who gave military assistance to the Union during the American Civil War and supported Lincoln's plan to issue greenbacks to bolster the U.S. economy, survived several assassination attempts. But he too was murdered in 1881.